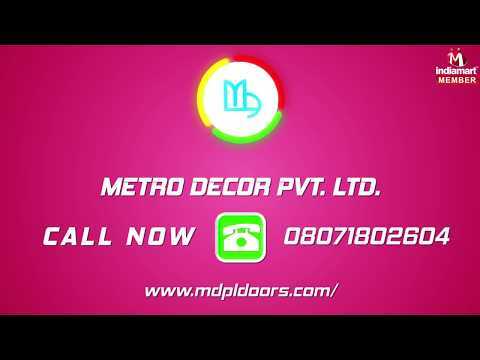 Established in the year 1999, Metro Decor Pvt. Ltd. is one of the largest manufacturer, supplier, distributor and trader of products like Wooden Moulded Panel Doors, PVC Fancy Doors, PVC Single Panel Doors, HDF Moulded Panel Doors, Membrane Doors, Engineered Veneered Doors, PVC Wall Paneling, PVC False Ceiling, PVC Partition and Cabinets, PVC Huts and Cabins, Aluminum Sliding Door and Window, Steel Railing and Doors and many more. We have hired an exceptional team of trained designers and engineers who gives these products an ultimate finish. We are known for well-timed delivery our products. Our wonderful team is our back bone of all our business. The team comprises of accomplished professionals, who carry enormous expertise in this industry.